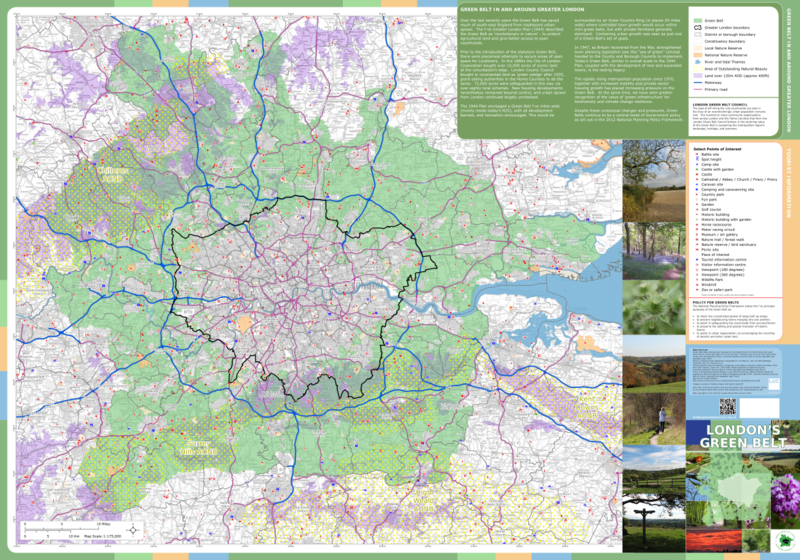 An interactive map of the London Green Belt can be found here. We try to keep it up to date with proposals which affect the Green Belt. Let us know if you are aware of threats which we have not shown on it. We have produced a paper map of the whole of the London Green Belt. 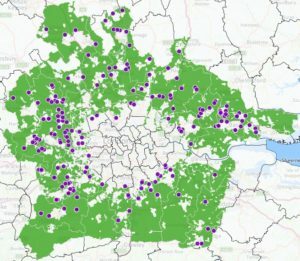 This is the first time the whole of the London Green Belt has been shown on a single sheet at a useful scale (1:175,000). An Order Form for copies of the map is here. There are other interactive maps of the Green Belt available on the internet. One is the Government-sponsored MAGIC site which covers the whole of UK. MAGIC stands for Multi-Agency Geographic Information for the Countryside. The map allows the overlaying of many other constraints and designations. CPRE have also produced a map of all Green Belts in England here. In all cases, it is the delineation of the Green Belt in the ‘Proposals Map’ or ‘Policies Map’ forming part of the relevant local plan which is definitive. It may be necessary to refer to these, especially where the finest detail of a Green Belt boundary is required. If you are not sure which local authority covers the area you are interested in, this webpage may help. Most local authorities make the proposals or policies maps available on their website. Unfortunately, local council websites are notoriously difficult to navigate around to find what you are after and nearly all councils are in a process of updating their local plans and/or their websites. The links below may be useful in taking you to (or at least nearer to!) the map showing the Green Belt. If you spot any errors or can fill any of the gaps, please let us know.